Elizabeth D Bakes is a company specialising in gluten free baked goods. Started by Elizabeth, a few years ago, the company has grown from market stalls to supplying to Whole Foods Market. What’s different about Elizabeth D Bakes is their founder does not have any allergies or intolerances. So why would someone with no personal need start a free from business? This is exactly what I ask Elizabeth. Elizabeth takes me through her journey learning about allergies from developing recipes free from gluten, what, eggs and dairy to start, as well as cross-contamination, and how to bake safely for allergies and coeliac disease. She tells me stories of her customers and how they shaped the development of Elizabeth D Bakes. How do you source ingredients? 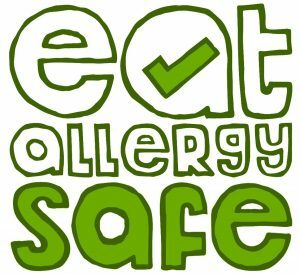 What have you learned about allergies and free from? When and why did you decide to have a dedicated gluten free kitchen? What was your first baking fail? What has been a baking success? Thank you to all of you who have sent me feedback. Your words of encouragement and how the podcast has helped you keeps me motivated to make more episodes! If you haven’t already, please leave a review on iTunes. If you have a question about your own allergy journey or from the episode, leave a comment below or post in our very own Facebook Group.